Woodbridge, Va. - The Carolina League second half North Division Champion Lynchburg Hillcats were eliminated from postseason play with a 6-2 loss to the Potomac Nationals on Sunday. The loss ends Lynchburg's back-to-back championship hopes, as the club dropped the decisive Game 5 in the series to the Nationals. Potomac will now play the Buies Creek Astros for the Carolina League Mills Cup Championship. With Potomac leading 2-1 in the bottom of the eighth, Aldrem Corredor blasted a grand slam over the wall in left field, extending the P-Nats lead to 6-1. Despite 36 come-from-behind wins this season, Corredor's homer proved to be too much for the Hillcats to overcome. Lynchburg opened the scoring in the second inning. Anthony Miller reached on a single with one out, and later came around to score on a Jorma Rodriguez RBI double to put the Hillcats ahead, 1-0. The Nationals came back to grab the lead with a two-run fourth inning. Ian Sagdal hit a leadoff single, and scored after Tres Barrera doubled to left field. On the same play, left fielder Mitch Longo had trouble digging out the ball of the corner, resulting in an error to allow Sagdal to cross home plate. After advancing on a ground out, Barrera scored on a wild pitch to put Potomac in front, 2-1. In the ninth, Lynchburg strung together three hits. Rodriguez laced an RBI single to trim the deficit to 6-2, but the HIllcats' comeback bid fell short. Rodriguez, in his first start of the postseason, led Lynchburg's offense in Game 5, going 2-for-4 with a double and two RBI. Eli Morgan (Loss, 0-1) started for the Hillcats and went 5.1 innings. The right-hander allowed two runs (one earned) on four hits, walking one and striking out four. Robert Broom made his Carolina League debut and picked up the final two outs in the sixth inning. Anderson Polanco allowed a run in 1.1 innings in relief and Dalbert Siri surrendered the grand slam to Corredor in the eighth. Jackson Tetreault (Win, 1-0) fired five innings of one-run ball for Potomac, allowing just three hits. Ben Braymer tossed three scoreless innings while picking up six strikeouts, and Jacob Condra-Bogan allowed the run in the ninth. Game 5 featured a total delay of 5 hours, 24 minutes. The clubs experienced a pre-game rain delay of 5 hours, 9 minutes, and another wait of 15 minutes during the first inning due to a power outage. Despite the loss, the Hillcats enjoyed an exciting 2018 campaign, in which the club qualified for the postseason for the seventh consecutive year. 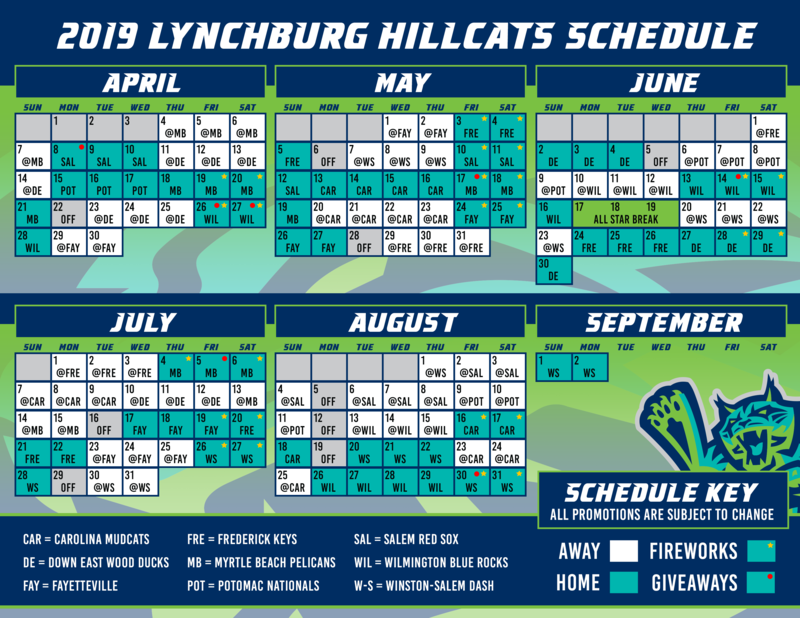 Lynchburg's 140-game 2019 schedule begins on Thursday, April 5, and 2019 season tickets are on sale now.